Available with ultraviolet or ozone sterilizer, . This deluxe high-capacity model has a 75 GPD RO membrane and 4 gallons of water storage for offices and factories of up to 60 people. 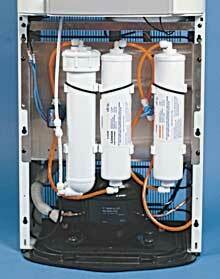 The taller spigot height means less bending and the larger opening allows for easy refills. The flat top supports coffee brewers or breakroom supplies. Free cup holder that attached to the side with your purchase. Cup holder holds 3" Dia. 5 oz. cups. Read benefits of adding optional features and see if it is right for you.